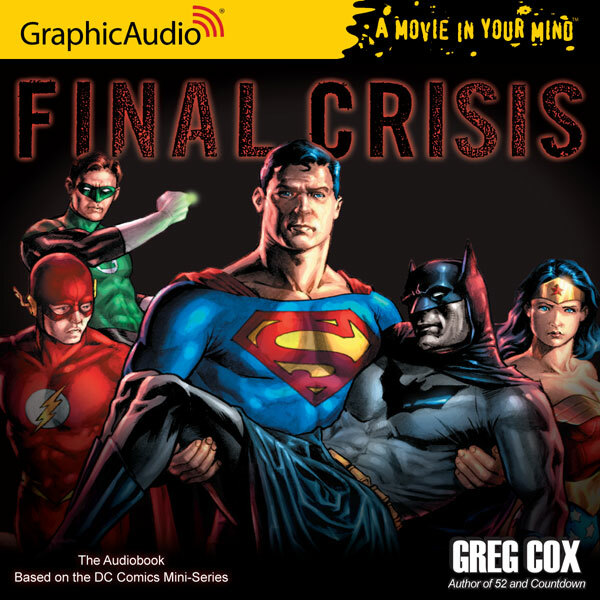 “Final Crisis” was a crossover storyline that appeared in DC comics published throughout 2008, primarily the seven-issue miniseries of the same name was written by Grant Morrison. This was the last of the multiverse type series from DC and sort of closed up some gaps left in the previous titles; “Crisis on Infinite Earths”, “Infinite Crisis”, “52”, and “Countdown.” However I think this created more questions than answers and served no other purpose but to confuse the reader. While having some great confrontations and interesting twists on science and gods the story just didn’t do it for me. I was so glad I listened to the audio book format of this title. As usual GraphicAudio delivers this audiobook with a punch, and I’m talking one of those full-graphic-with-exploding-colors-as-only-seen-in-comic-books punches. 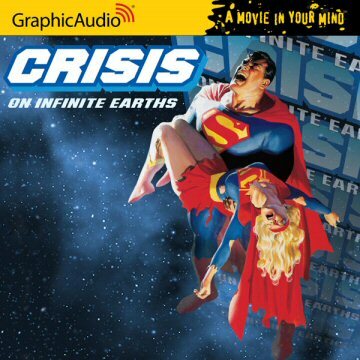 When GraphicAudio promises a “Movie in your Mind” they aren’t exaggerating. First off the voice actors are superb and voice each character with precision accuracy, Superman sounds like Superman, Batman sounds like Batman and so on. There is no denying the excellence in the talent pool here. The sound effects will blast you out of your seat. With planets exploding or crumbling, a black hole sucking in the multiverse and even Green Lantern’s ring fizzling out, the sound effects are perfect. And the music, well pretty much all I can say here is “WOW!” The music moves the story, mood and action perfectly. All in all these GraphicAudio productions are perfect. For me it was the only saving grace in this title. The gist of this story is that one of the new gods, Orion, is murdered and another new god, Darkseid, sees this as his chance to take over Earth. Also one of Earth’s multiverse monitors is stripped of his powers for letting Earth 51 be destroyed. While some of my favorite heroes play major parts in this, The Flashes (yes 3 generations of The Flash) open a time portal allowing things to begin and end, and The Green Lantern Corps try to stop Darkseid, I think the story relied too heavily on Superman. Throughout the story I was confused as to what caused what and with The Flashes and Superman doing a little time traveling that just made it even more hard to follow. But thanks to GraphicAudio, I had a great time listening.